Amir (Reed Haley), the leader of a small nation, is dying. A mad surgeon, Dr. Trenton (Kent Taylor) plans on putting his preserved brain in a new body so he has Amir wrapped in tinfoil and then sends a disfigured giant, Gor (John Bloom [ No, not Joe Bob Briggs, a different John Bloom.]) to acquire a new body. Naturally this goes wrong and Dr. Trenton is forced to put Amir’s brain into Gor. Nothing could possibly go wrong with this plan, right? 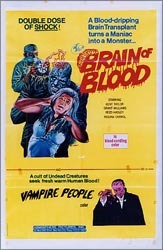 'Brain of Blood' starts out promisingly. There’s some brain surgery played for maximum grossness, a little lab assistant who likes to torment some girls chained up in the basement, and some plotting and backstabbing between Amir’s followers and Dr. Trenton. All of this comes to a screeching halt in the long tedious third act, which sees everyone wandering around outside and failing to meet each other for what feels like hours. It does all end in an unexpectedly sinister coda, but’s far too late to salvage any interest.